This page is dedicated to our customers. The items posted are letters from customers, as well as pictures and quotes from satisfied customers. Please feel free to contribute. Coast to Coast in a 1929 Ford “Woodie” Station Wagon With a Schwalms rebuilt engine !! On July 15, 2010 my wife and I traveled west from Massachusetts to Vancouver British Columbia to attend the 2010 International Model A Ford Convention. We drove our 82 year old 1929 Ford Model A Station Wagon and our close friends joined us in their 1931 Ford Town Car from Southboro, Massachusetts. Our 2 antique vehicles were weighted down with extra tools, car parts and several suit cases. I had installed a cigarette lighter so I could operate my G.P.S. to help quide us to our destination. On our trip west we traveled through Massachusetts, New York, Toronto area, Michigan, Minnesota, South Dakota, Wyoming, Montana, Idaho and Washington and then north into the Vancouver area. While we enjoyed meeting many of the 900+ people attending the convention it was a great photo opportunity to photogragh many of the 500+ Model A Fords. What I didn’t expect was receiving the “Long Distance Award” for driving my antique vehicle across the country. I also won a 3rd place award for my 29 Station Wagon in the car judging. In one fast exciting week the convention was over but we were glad to be back “on the road again.” We headed northwest from Vancouver towards Banff National Park in Calgary, Alberta Canada. From there we headed south to Montana, Wyoming, Nebraska, Iowa, Southern Wisconsin, Michigan, Ohio, Pennsylvania N.Y. and home into Massachusetts. We had traveled to so many places we had never seen before. We thoroughly enjoyed the many National Parks, Monuments and Museums, ( several auto museums ). This trip was an experience we will relive through our 700+ photographs we took. The 82 year old vehicle completed the 7,400 mile trip in 28 days ( plus 7 days at the convention ) with only a few minor glitches. A small crack in my windshield, 2 flat tires- fixed on the road, distributor points closing- quickly adjusted, a leak in my radiator-repaired on the road and a spark plug that had to be replaced when the porcelain cracked,….only minor setbacks for the 82 year old vehicle. We also climbed some very high mountains in the Rockies in Canada,….9,0000+ feet plus climbing 6,900 feet at Glacier Park which had opened a few weeks before after a snow storm in June. We experienced snow, a tornado in South Dakota and 100+ weather in Montana. We also had many “roaming” roadblocks,….Black Bears, Mountain Goats, Big Horned Sheep and yes Buffalo,….plus millions of grasshoppers that we had to periodically clear off of the radiator. Once we got home it didn’t take to long before planning our next trip to Marquette, Michigan in 2012, which is only 3,000 total miles,…a piece of cake. Epilog,………We traveled through 14 states and 3 Canadian Provinces. We traveled through 5 different time zones, Alaska, Pacific, Mountain, Central and Eastern. We crossed the Continental Divide 6 times. Thank you Ora for the your quality work in rebuilding my Model A Engine !!! I’ll be restoring a 1929 Cabriolet soon and will have you rebuild this engine also. After purchasing a 1931 model AA dump truck for a restoration project. I had to make a decision on who I would hire to rebuild my engine. Since this in the only part of the project that I could not do myself, it was important to me that somebody with experience and a reliable reputation perform this part of the restoration. Ora Landis of Schwalm's Babbitted Bearings fulfilled these requirements. Ora has proven to me that he not only understands all mechanical aspects of the model A but, also appreciates the owners trying to preserve of these antique cars. He has been professional and courteous every time I had a question or conversation with him. I can drive my AA truck with confidence knowing the engine was rebuilt with close attention to detail. A reliable engine means a lot when your in the hauling business....even though I may be only hauling feathers. 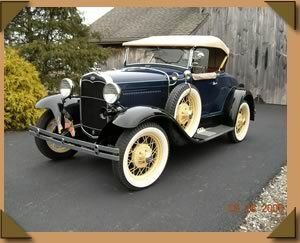 I became very familiar with the reputation and quality of the work performed by Schwalm's Babbitted Bearings when my father and I had the engine in our newly-acquired '31 Roadster completely rebuilt by their founder, the legendary, late Mr. Bud Schwalm, in 1988. When my father passed away in 2001, I inherited the car and determined to get her back on the road after nearly ten years of non-use and dusty, neglected storage. Realizing the extensive amount of electrical and mechanical work required to make her a solid "driver", I knew I would have to entrust the car to a thoroughly-experienced professional who specialized in Model A's. I was happy to learn that the skills and traditions of the original Schwalm's Babbitted Bearings were being carried on by Mr. Ora Landis, who had spent many years working with Bud. When I visited Ora's new, expanded shop location in Strasburg, PA, I was again impressed with the equipment, tooling, facilities, his very experienced staff and the long line of customers waiting to move their cars into one of his "restoration bays". I also knew my Roadster would feel right at home with the several other "Old Fords", in various stages of restoration, that were in the shop. 13. Final cleaning, detailing and test driving. Many other details were worked and made "correct" as Ora was careful to point them out to me and keep me constantly informed of the progress. I'm sure that, not since she rolled off Henry's assembly line in March, 1931, has my Roadster been in such "correct" and excellent-operating condition. The direct and personal working relationship with Ora and his staff made this project all the more enjoyable. I readily recommend Schwalm's Babbitted Bearings to any "A" (or "T"!) owner who seeks to have the best possible work performed on their engine, transmission, running gear and electrical system. All work is done with strict attention to original specifications, the use of quality parts and personalized workmanship. Any special instructions you present to Ora, are carefully discussed and implemented. Ora and Schwalm's Babbitted Bearings have truly taken the dreams we had for our tired old Roadster happily into the New Millenium! I had on two occasions been down to Schwalm's machine shop. On both occasions I had the pleasure of conversing with one Ora N. Landis who in my opinion has an excellent understanding of the Model A's - all of them and every part of them. His professionalism is only excelled by his ability as a machinist, and his knowledge of the Model A is commendable. Prior to meeting Mr. Landis at the shop, I did not know the man. Two meetings and it seems I've known him a long time. 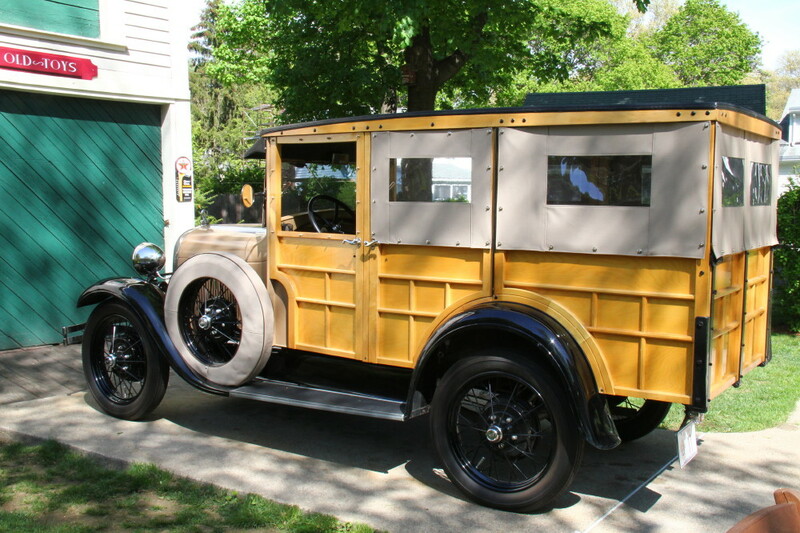 "I picked Schwalm's Babbitted Bearings to rebuild my '31 Engine after doing my research. I asked previous MARC National Award winners, as to who did their engine work. After meeting Ora Landis, and doing a complete shop inspection in person, I decided to take my engine to have a complete overhaul. This included having it balanced and counter weighted. The work was done, on time, in a business like manner. 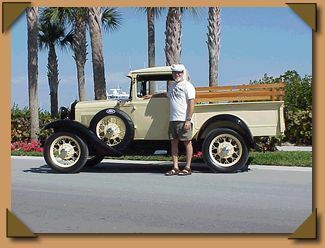 My 1931 Widebed Pickup is now a MARC Touring Winner with a "Touring MARC of Excellence", in years 1999 & 2000. 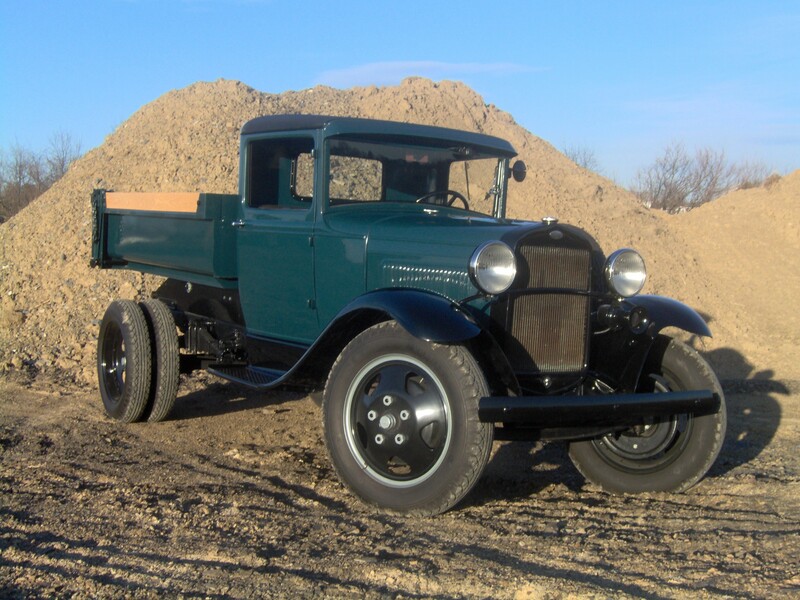 Good work does cost a bit more, but it is worth it, for the peace of mind when driving my Model A Pickup!" 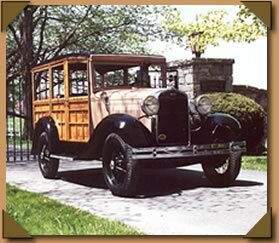 Our Model A Station Wagon has been a valued vehicle of the Karcheski family since William Karcheski purchased it new in 1931. Under our watch, of this "family member", Ora Landis has provided professional machining and mechanical work. He has replaced burned valves, machined and rebuilt the steering box, turned new cast iron brake drums true and rebuilt the brake backing plates-mechanism. Ora has willingly provided valued advice and encouragement to help us through difficult rebuilding tasks. We find him to be a man of great mechanical skill and knowledge. Additionally, he possesses the most important quality for anyone in business, integrity. 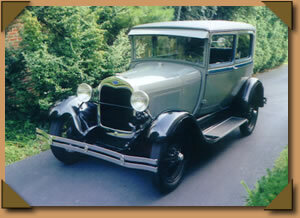 I do not hesitate to recommend Ora to any member of the antique Ford fraternity. I would like to thank you for the personal attention and the tour of your shop. It was very interesting to see and hear you explain the difference procedures you will take in rebuilding my engine and transmission. I was very impressed with your quality of work and attention to detail. We will be visiting the area in a few weeks, at which time I will be bringing you the carburetor, exhaust and intake manifold, water-pump and lower water inlet pipe.